Our eyes are exposed to a wide variety of environmental conditions such as extreme weather, work environment and wearing contact lenses. Sometimes these conditions may be so harsh that they stress the cornea, the outermost eye structure. Occasionally a patient will present in my office with an extremely compromised cornea. 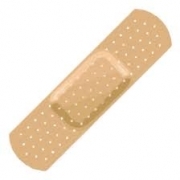 Such cases sometimes need a form of an eye band-aide to properly heal. Such a bandage is an amniotic membrane which is derived from the placenta of an elective c-section. Human amniotic membrane is a unique collagenous membrane derived from the innermost submucosa of the placenta. Harvested under sterile conditions from the placenta of elective C-section after a full term pregnancy in medically cleared donors. This type of tissue has been used widely in the treatment of surface ocular diseases as it aids epitheliazation, reduces inflammation and fibrosis, prevents structural damage, and is also known to have some antimicrobial properties. It is used for a wide variety of ocular surface disorders such as: corneal ulcers, chemical or thermal burns of the cornea, and persistent epithelial defects. An example used in our office is the ProKera Ring. It is a cryopreserved, sutureless amniotic membrane clipped to a plastic ring. ProKera is placed on the eye in a similar fashion as a large contact lens. ProKera does not require an operating room and can be performed in the office. Most importantly, it is reasonably well tolerated by patients. Blog contribution by Lilia Babakhan, Optometry Intern, College of Optometry, Western University of Health Sciences.